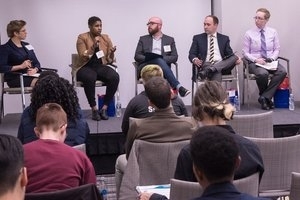 Earlier this semester, students, faculty, and alumni gathered in Constitution Hall on AU's East Campus for the fifth annual Being LGBTQ in the Workplace event. The event was co-hosted by the AU Pride Alumni Alliance and AU Pride. Cheyenne Cook, SIS/BA '16, Michael Cole-Schwartz, SPA/BA' 02, Foster Curry, CAS/BA '10, Charley Fogel, CAS/BA '13, and Daniel Honeycutt, WCL/JD 14 served on the panel. The event was moderated by Dr. Naomi Moland, a professorial lecturer at AU's School of International Service. The event kicked off with brief introductions of the panelists, who came from a variety of different professional backgrounds: government, private sector, NGOs, and self-employed. Then the panelists delved straight into their insights on the application, interview, and hiring processes. They agreed that it is incredibly important to find an employer that will be the right fit for an individual. This should include rigorous research of potential employers, potentially with the use of sites such as Glassdoor, to ensure that they are LGBTQ-friendly. Panelists stressed the importance of understanding a prospectiveemployer's benefits package as it pertains to LGBTQ couples and transitioning, in particular. Panelists also discussed their day-to- day experiences in the workplace as LGBTQ individuals. Some worked in a place where the culture was very heteronormative. They stressed the importance of communicating with your employer to find a comfortable situation and find a healthy work-life balance. One panelist shared a story about the process of coming out as transgender and eventually deciding to leave an intolerant employer. Further, the process of legally changing one's name was discussed. Other panelists worked in more accepting environments, but still stressed the importance of finding shared interests with their colleagues to foster friendships and a good work environment. During the event, many personal and insightful stories were shared, which paved the way for a frank and open Q&A. The audience asked for more insight into being trans in the workplace and how to navigate transitioning. An additional question concerned working internationally as an LGBTQ individual. A discussion followed about the importance of ensuring one's safety and the need to navigate different cultural interpretations about one's identity. The event closed with opportunities for panelists and audience members to have further conversations, and many in attendance took advantage of this. Attendees personally connected with panelists and shared stories and experiences and sought advice. The event was well-attended, and the environment was very positive and supportive. Students and alumni alike were given the opportunity to contemplate their career paths as members of the LGBTQ community. It was also an excellent networking opportunity with students and alumni meeting others who shared similar experiences. Plans are underway already for the sixth annual Being LGBTQ in the Workplace event in 2019. We hope you can join us.